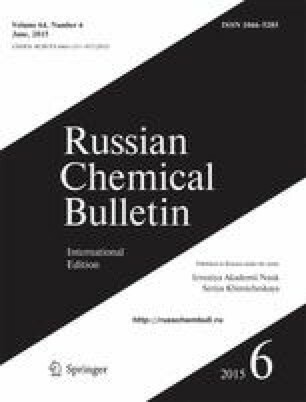 Complexes of organotin compounds R2SnCl2 with bisand trisphosphonate derivatives of 2,6-di-tert-butyl-4-methylphenol (ionol) were synthesized. X-ray diffraction studies were carried out for some of them. The redox properties of the synthesized compounds were characterized by cyclic voltammetry. Antioxidant/prooxidant activity of the complexes was studied using a new electrochemical method based on measuring the rate of hydrogen atom transfer to the stable radical 2,2´-diphenyl-1-picrylhydrazyl (DPPH). The data obtained were compared with the results of studying activity of the compounds during lipid peroxidation (LP) in biological samples. A correlation is observed between the results on antioxidant activity obtained by electrochemical DPPH test and using biological samples. Unlike the initial organotin compounds, the synthesized complexes have antioxidant activity, whereas phosphorus-containing phenols exhibit the properties of efficient antioxidants and chelating agents. Published in Russian in Izvestiya Akademii Nauk. Seriya Khimicheskaya, No. 6, pp. 1419–1429, June, 2015.